If you are looking for a unique Present for family or friends who loves their dogs or cats or perhaps for someone who has lost their favorite companion - we will get the Gift Voucher to you - by Royal Mail Signed For - First Class - by almost the next day. This will help you avoid last minute dashing round. We can also post directly to the person it is a Gift For. (Almost everyone we have made these for - seem to be very happy with what we have done. Our animals sometimes are a little whimsical - we seem to pick up a characteristic of the animal). 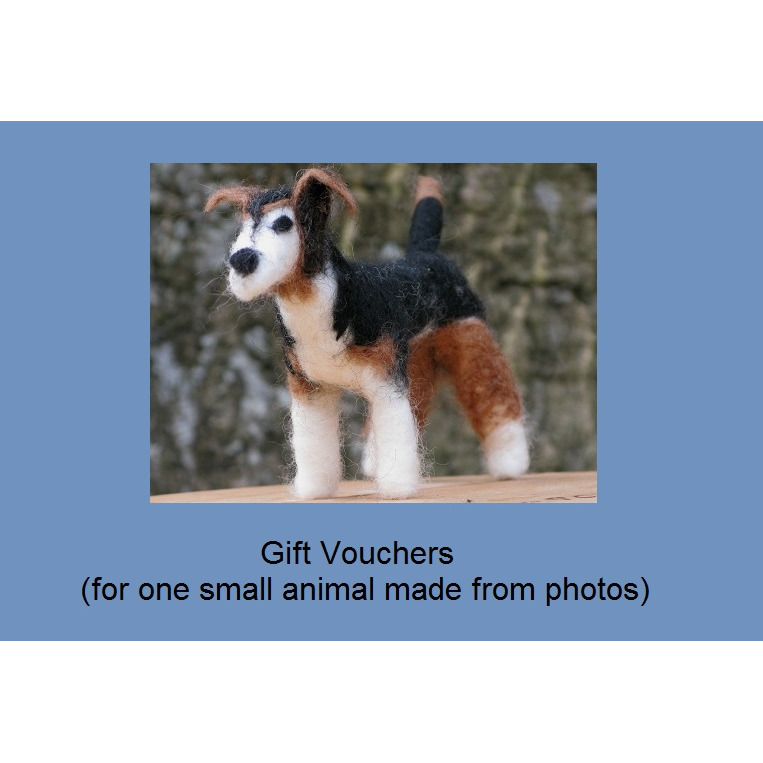 Our Price is for a Gift Voucher to give as a Christmas or Birthday present - instructing us to make a wool version of a small animal from Photos sent to us by the person receiving your Gift and includes the cost of Postage to send the completed animal to same person by Royal Mail Signed For Second Class. This animal will be small enough to hold in your hand - bigger dogs we will felt onto a metal frame. We will need the person receiving the Voucher to contact us at info at honeybeeswax.com with 4 photos (front, back and both sides) of their woofs or pudder, tell us the breed, age - name and boy/girl would also help - and we will organise wools to match the color of the animal (if we need to) and let the person know how long it will take (usually about a week or a little longer if we need to order wool). We will add a Tibetan Silver Handmade symbol to the animal and include a wooden Birch slab for display and we can make a Scarf or Collar, if you would like.